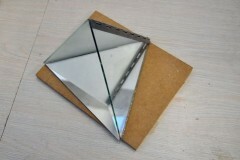 Robert Smithson describes his Mirrored Crystal Structures – which I understand to be his steel and mirrored plastic sculptures of 1963-4, inspired by Donald Judd’s pink plexiglass box. To me the pieces are at once garish hall of mirrors and ominous science fiction emblems, fragmenting, fracturing space around them. 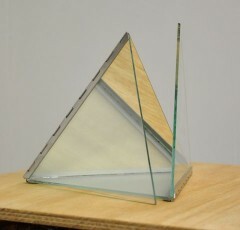 Rob has now glued two 20x20x20cm pyramids. The panels unfold smoothly, elegantly (some independently! when set gently in motion). Looking around and through their variously shiny-clear, translucent and mirrored panels, the shapes appear to coalesce into one complex, crystalline structure. 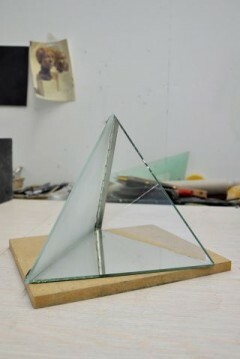 On Sunday we made a paper maquette for a new, taller tetrahedron, one that echoes more closely those of the aviary frame. 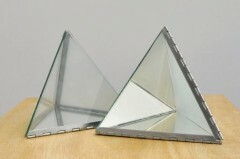 We talked about possibilities for suspending the objects (again, a mobile architecture) also of fusing two pyramids base-to-base to create an even more crystal-like form. 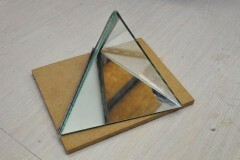 For now, we’ve decided to work towards a ‘landscape’ of three pyramids, a triad, each slightly differently proportioned. Imagining this landscape, I keep returning to the silhouette of Wassily Luckhardt’s futuristic Cinema, which reminded Rob of this Norman Akroyd etching of the archipelago of St Kilda. 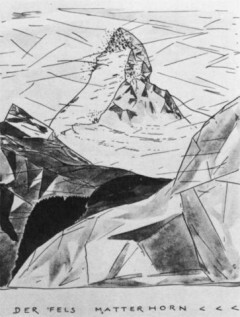 Robert Smithson, ‎Jack D. Flam (1996) ‎Ultramoderne, Robert Smithson: The Collected Writings. Reading the essay Michaela gave me by Rosemarie Haag Bletter made me think of other writing and imagery relating to crystal structures. Robert Smithson’s quote above describes the Manhattan skyline of the 1930s as a decadence of ‘tarnished reflections’. Smithson describes the city with imagery of solidity, transience and the eternal. In the Louvre on a visit in 2012 I came across the lid to the sarcophagus of Dioscorides which captures some of the spirit of what Smithson was writing about. Dioscorides was a Greek civil servant buried in the Egyptian style during the 2nd century BC. The inside of the half-ton graywacke stone lid is delicately carved with the figure of the sky goddess Nut against a starlit sky. It’s a beautiful metaphor of weight and transience. The sensuous and protective image of Nut would have pressed against the mummified body of Dioscorides and his spirit would need to pass through the body of Nut to reach the afterlife. The art of the tomb looks inward – the focus is on the body entombed. 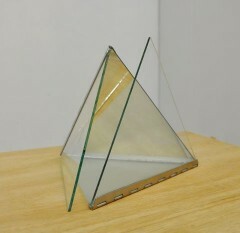 There is a parallel with Smithson’s infinite pyramid, which holds and refracts light inward. Richard Grayson’s film ‘The Golden Space City of God’ is a choral piece sung by a Texas choir and based on the visionary writings of a 1960s US Evangelical sect known as ‘The Children of God’. I saw Grayson’s film at Matt’s Gallery in London in 2009. 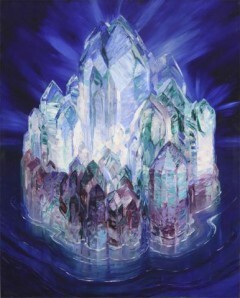 The sung narrative describes a shining crystal vision of heaven, and the apocalypse. It returns to the Old Testament writing about Solomon’s Temple referred to in Bletter’s essay and gives it a contemporary twist: an ancient science fiction. The National Gallery in London has a painting by the artist Bartolome Bermejo entitled ‘Saint Michael triumphs over the devil’ 1468. A reflection in St Michael’s breastplate of the kingdom of heaven is depicted as a series of golden crystal spires over water, rather like the heavenly spaceship in Grayson’s film. The painting plays a type of tromp l’oeil game by suggesting that the kingdom of heaven is just behind the viewer. While standing in front of the painting I feel that if I turn around fast enough I might catch a glimpse of this crystalline heaven. This game with reflection is balanced by St Michael’s shield, which faces down towards the devil. The shield is the most mysterious object in the picture. It appears to be made from a crystal ball and unlike the shining breastplate it is ominously opaque with just a hint of dim light. Perhaps there are no reflections in hell. The whole painting is a playful game of shadows and reflections, crystals and lenses, and the many hallucinatory eyes of the devil are echoed in the opening of a poppy flower. During our second studio meeting I photographed Rob’s latest glass tests (which are looking and feeling beautiful – visually complex, so solid after my acetate maquettes! and with a fragility and sharp-edged-ness that I’m not yet sure how to handle…) Set to auto-focus but unable to settle, my camera whirred between the pyramids’ layers of shadows and reflections in wonderful ocular mimicry. They were a pleasure to photograph and even in these quick snaps the difference/distance between the objects in space and their flattened screen-images is significant. Robert and I met last weekend to watch a screening of Jessica Warboys’ short films. Poetical performances, painterly theatrics, I’m particularly interested in the ways she works with objects in space – both real space and film space. In her introduction Warboys spoke of a mirroring between her paintings and her props, between the gestures she makes on canvas and those made in performances – this extends to her film language as well, her camera spiralling, sweeping as bodies and objects do, exploring, re-framing the environment. Props are both found objects and fabricated (sculptural) pieces, which echo shapes, patterns, rhythms in the landscapes – material, tonal as well as formal conversations.